CSIR JRF NET Life Sciences Coaching Institute Delhi. India's Largest & Delhi's Unique Coaching Institute Now become No-1 in India. Delivered NET-JRF Ranks 6 & 7 in Life Sciences 2017 Examinations. NET JRF Life Sciences Regular Classroom (Daily/Weekend) Programme is a highly comprehensive and advance programme for CSIR-JRF-NET as well as GATE Life Sciences | Biotech | DBT-JRF | ICMR | GRE students. This programme shall offer you the Best of classes, problem solving and doubt sessions supplemented with in-depth, thoroughly revised study material. This will help you to develop comprehensive understanding of core concepts and its applications. You will be given some periodic tests which will be supplemented by test analysis sessions. Regular Test shall help you understanding the basics of question pattern. This will not only give you a feedback but also develop the examination temperament. Study Online through direct video steaming of class lecture or through recorded video lecture and appear in Online Test Series of NET Life Sciences through our online course programme. 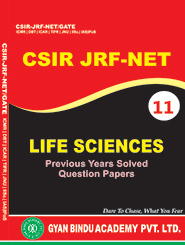 Buy NET JRF Life Sciences Study Material from us which is the set of 11 Books available at very nominal cost. Get Study the Books & appear to our Online Test Series of NET JRF Life Sciences. Subjects covered under this Programme will be Biochemistry, Microbiology, Cell biology, Immunology, Diversity of Life, Molecular genetics, Ecology, Evolution, Plant and Animal physiology, Plant and Animal-General features, Classical Genetics, Biotechnology and General Aptitude. The coverage of syllabus will also help the students to target GRE (Subject), IISc. Ph.D, JNU Ph.D., ICMR-JRF, DBT, TIFR, NBRC as well as GATE Life Sciences | Biotechnology. 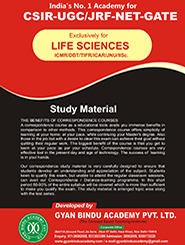 Great Discount on Correspondence Study Material..
Study material for CSIR / JRF / NET, consisting of a set of section A,B & C, 16 books..
Addmission to New Batches of CSIR NET Life Sciences, IIT JAM Life Sciences, IIT JAM Biotechnology, M.Sc. Entrance Life Sciences, M.Sc. Entrance Biotechnology is open. Biotechnology is renowned applied science stream with a remarkable future. Weekend Classes (Sat. & Sunday) for final year students. Concise & error free study material. The credit for my qualifying CSIR-JRF examination goes to CSIR NET Coaching. I am obliged to its director as well as team members for their efforts to make me successful. It was the methodology and conceptual way of teaching in all the subjects which enabled me to achieve the success in the exam. I appreciate the unparalleled competitive environment experience created in all the classes. I have a strong belief that GBA is the best institute for coaching in life sciences and dedicate my success to the academy. I acknowledge that CSIR NET Coaching is the best coaching institute for CSIR-JRF NET. 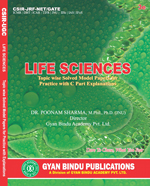 It provides a through introduction to the practice of life sciences. It makes available an excellent learning material with realistic assignments at the end of each lesson. The response from the faculty is always admirable and affirmative. The administrative services are outstanding. Yes, of course it is a valuable learning experience. I love it, it relates to all the things I am presently preparing for my exams and I am finding it extremely useful. I love getting my corrected assignments back. It is always an exciting moment, which I share with my family at dinner table. The course was more in-depth than I thought it would be and I could apply the information with my own thoughts. Thanks to the CSIR NET Coaching and its staff for their excellent assistance, feedback, and general help. I found them all to be excellent. They were very patient and equanimous. The feedback on assignments was very constructive and to the point with positive and motivating guidelines. I thoroughly enjoyed the course at CSIR NET Coaching. Quality and commitment is the strength of this academy as it boosts the confidence of every student in all respects. Right from the first class, the faculty here has been striving to prepare the students in the examination oriented approach. I thank all teachers and staff members of the GBA for being with me devotedly, and for providing the best coaching for CSIR-JRF. I wanted to study for CSIR JRF NET, but I could not find any coaching courses in nearby locality. CSIR NET Coaching offered the best option - study at home, at my convenience and faculty contact available to me whenever I needed it. The faculty encouraged me to prepare for JRF NET exam. Although my level was not up to CSIR exam, but with efforts and support of the faculty, I cracked the exam. With GBA I was able to study at my own pace and thoroughly research the subject matter thereby, broadening my knowledge and study experience. I enjoyed the way in which the subject matter was presented as it allowed me to study each subject further, with greater depth, clarity and knowledge. Overall, there are not many areas in which the course subject matter will not turn out to be invaluable; everything is covered to allow you to become successful. CSIR NET Coaching provides the finest training program I have ever attended. In my view, I have attended the most sophisticated program that teaches an amazing curriculum, involving great techniques with compassion. I joined CSIR NET Coaching for CSIR JRF NET. I feel that during the duration of the course, I gained a lot of knowledge and learned practical strategies that were beneficial to me in both ways, personally and professionally. The course superceded my expectations. Thank you all! The JRF-NET exam was such a difficult one that I could not have cleared it on my own. I appreciate the efforts put by GBA. I found your services to be extremely helpful and would refer you to my friends too. You are doing a great job. At CSIR NET Coaching, the idea I conceived was that the exam for which I was worried, was actually predictable. I gained a lot of confidence under the guidance of the experienced faculty. Being able to teach myself on the topic that interests me with the help of distance education has been very valuable. Living in a remote area has a number of disadvantages including the lack of means to continue education. Completing successfully the course has enabled me to think ahead and possibly attempt future studies on this issue of need. The course was designed in such a manner that learning gets unlimited. I have gained a lot of knowledge from the course. The assignments really good as they help the students to think out-of-the box. Also, professional support being extended by the faculty and administration team is simply great and I am thankful to all of them. I highly recommend CSIR NET Coaching Coaching Institute. CSIR NET Coaching programme is above other programs that I have studied before. Not only Academy teaches an exceptional curriculum, but it also gives priceless lessons in syllabus and we have access to many other books and resources. Gyan Bindu approach is sincere and includes all aspects of learning. It is an extremely organised institution, and the courses are well focused. Very impressive, helpful, and I am comfortable because I can do it at my own pace. I have been very happy with the coaching services offered. The administrative staff was always supportive.